A 68-year-old obese man underwent computed tomographic colonography (CTC) scanning to investigate worsening constipation and lower abdominal discomfort on his left side. Optical colonoscopy was contraindicated because of his comorbidities. A preliminary CTC diagnosis of incarcerated Spigelian hernia was made, based on lateral deviation of the sigmoid colon to the left as well as extrinsic impressions on it, and the central location of the small bowel. Spigelian hernia is a rare form of anterior abdominal wall hernia. CTC can play a role in its diagnosis. 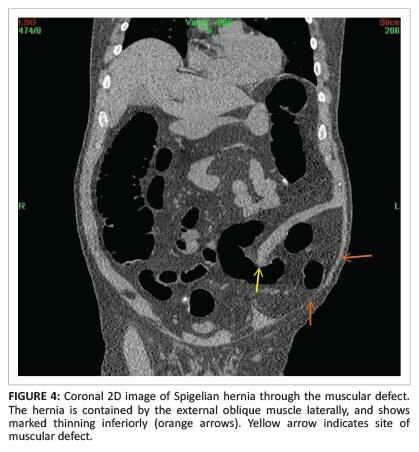 Computed tomography (CT) has been shown to produce the most accurate imaging in the diagnosis of Spigelian hernia. 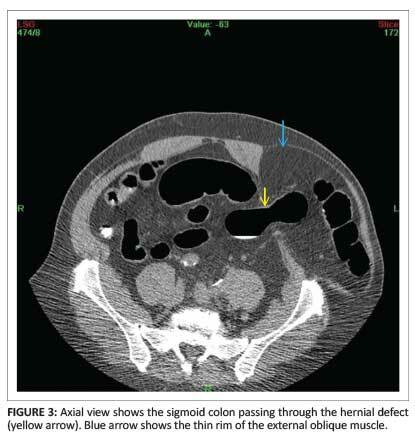 In this case report, CT colonography (CTC) demonstrated additional findings, making the diagnosis more readily achievable. A 68-year-old obese man was referred for CTC scanning by a gastroenterologist. His primary clinical history was worsening constipation and lower abdominal discomfort on his left side. Optical colonoscopy was contraindicated because of his comorbidities of hypertension, ischaemic heart disease, diabetes and chronic obstructive airways disease. A low-dose CTC technique, CO2 insufflation and a 16-slice General Electric multidetector CT (MDCT) scanner were used for the study. As the patient was obese, a standard two-view supine and prone study could not be performed; therefore right and left decubitus views were done instead. Filling the colon with three litres of CO2 took approximately seven minutes, compared with the average time of three minutes. The CTC study showed an incarcerated Spigelian hernia (SH), without evidence of obstruction. The colon map views showed three important findings: (1) the sigmoid colon was markedly displaced to the left; (2) the small bowel was in a central position (Figure 1a); and (3) in addition, the air-contrast colon map demonstrated two external impressions on the sigmoid colon at the point where it enters and exits the muscular defect (Figure 1b). 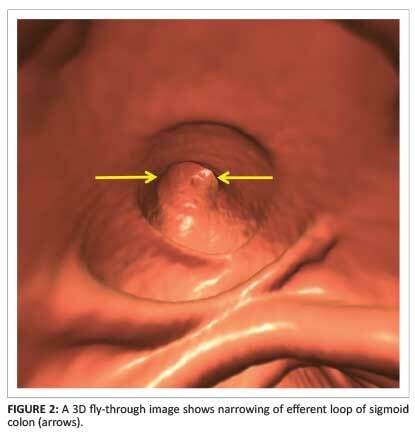 Slight narrowing of both the afferent and efferent loops of the sigmoid was noted on 3D fly-through imaging (Figure 2). A 2D image below the umbilicus confirmed a defect through both the internal oblique and the transversus muscles. The sigmoid colon was contained in a hernia. An axial view demonstrated a thin rim of the external oblique muscle laterally, indicating an interstitial or interparietal geographic location of the hernia (Figure 3). Coronal and sagittal 2D images clearly demonstrated the SH (Figure 4 and Figure 5). In view of the patient's comorbidities, surgical intervention was not an option at this stage. He was fully briefed by the gastroenterologist in this regard and made aware of the risk of obstruction or strangulation. He was informed that, should this occur, surgical intervention would be required. Diagnosis is, however, primarily made by CT.1, 4, 5 In the present case report, a CTC was performed for investigation of abdominal discomfort and worsening constipation. A diagnosis of SH was made based on the lateral deviation of the sigmoid colon as well as the two extrinsic defects on its wall (Figure 1a and Figure 1b). 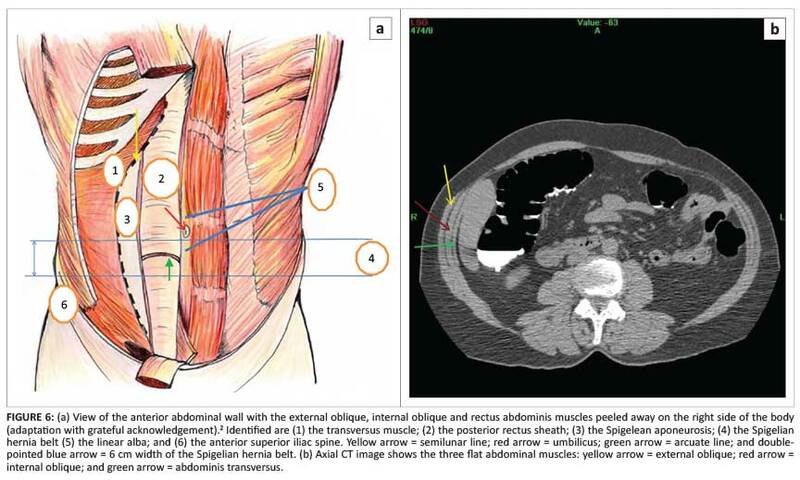 The diagnosis was confirmed by the 2D study which showed an interparietal SH containing sigmoid colon and a clear hernial defect in both the internal oblique and transversus muscles (Figure 4 and Figure 5). CTC is a minimally invasive, fast, safe and accurate screening examination for colorectal cancer. It is also suitable as a diagnostic study for patients with gastrointestinal symptoms. Furthermore, it allows evaluation of extracolonic structures in the abdomen and pelvis. It is important to know the anatomy of the abdominal musculature when diagnosing SH. There are three flat and two vertical muscles of the anterior abdominal wall (Figure 6a and Figure 6b). The flat group consists of the external and internal oblique muscles and the transversus abdominis muscles. The vertical group comprises the rectus abdominis and pyramidalis. The transversus abdominis muscle is the innermost of the three flat muscles, with a transversomedial orientation. Superior to the arcuate line, the aponeurosis of the tranversus abdominis muscle splits to form part of both the anterior and posterior rectus sheath. Inferiorly to the arcuate line, the aponeurosis of the transversus abdominis muscle passes anteriorly to form part of the anterior rectus sheath layer. This arrangement allows for a potential area of weakness posteriorly. The rectus abdominis is a vertical muscle that is wrapped anteriorly and posteriorly by the aponeurosis of the three flat muscles. The lower third has no posterior cover. The pyramidalis is absent in approximately 25% of individuals. It is a small, insignificant muscle situated in relation to the inferior margin of the rectus. A diagnosis of SH, based on plain-film radiographs, upper and lower gastrointestinal studies, and follow-through studies, is not readily made in the absence of an intestinal obstruction.7There has been reported use of magnetic resonance imaging (MRI) for investigation of SH.10CT, however, is the main imaging modality. As is evident in the present case report, CTC can play an important part in the diagnosis of SH. The main advantage of CTC is that the entire large bowel and all extracolonic components can be visualised. 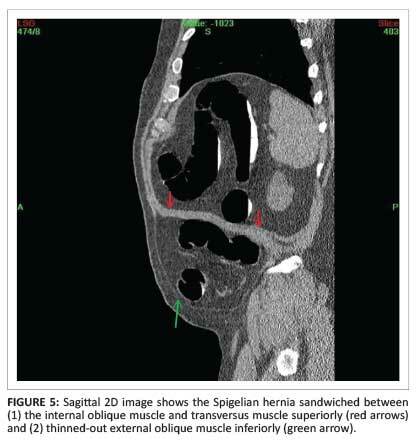 The complementary role of 2D and 3D imaging in the diagnosis of SH is well demonstrated in this case report. Clinton Bopp is thanked for drawing the line diagram of the abdominal musculature. The author declares that he had no financial or personal relationship(s) that might have inappropriately influenced him in writing this report.